Portugal is a vast country made up of diverse landscapes. Its scenery is one of the many reasons we fell in love so quickly and why we’ve already been back twice since our initial visit. Due to its location on the Iberian Peninsula, Portugal has a seemingly endless coastline. 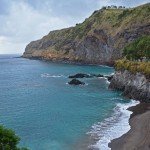 This coastal country also boasts several island chains that are definitely worth a visit, including the Berlengas Islands, and the Azores , which we visited on a return trip! Just a short 20-minute drive from where we were staying in Obidos is the town of Peniche, and just a 7-mile boat ride from there is the Berlengas archipelago. Its largest and only habitable island is Berlenga Grande, which can be faintly seen from the mainland. There are a variety of boat companies at the Peniche Harbor eager to whisk you away to the enchanting beauty that awaits you on the island of Berlenga Grande. Pop a few seasickness pills and get ready for a 35-50 minute bumpy ride! You know the seas are going to be rough when they pass out plastic bags before departure! 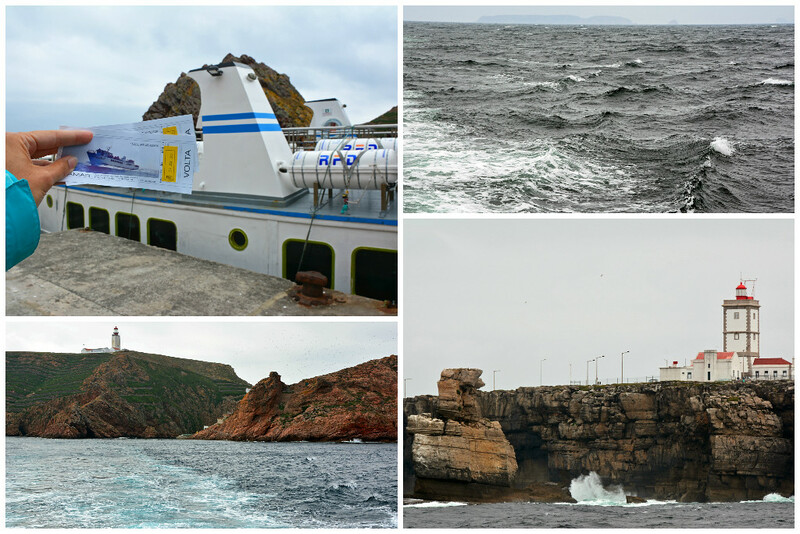 Due to consistent inclement weather, trips to Berlenga Grande only occur during the summer months (May-September), and as such, there is limited availability. 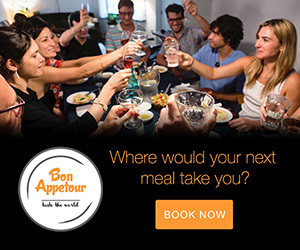 It is recommended that you make reservations in advance to avoid disappointment. 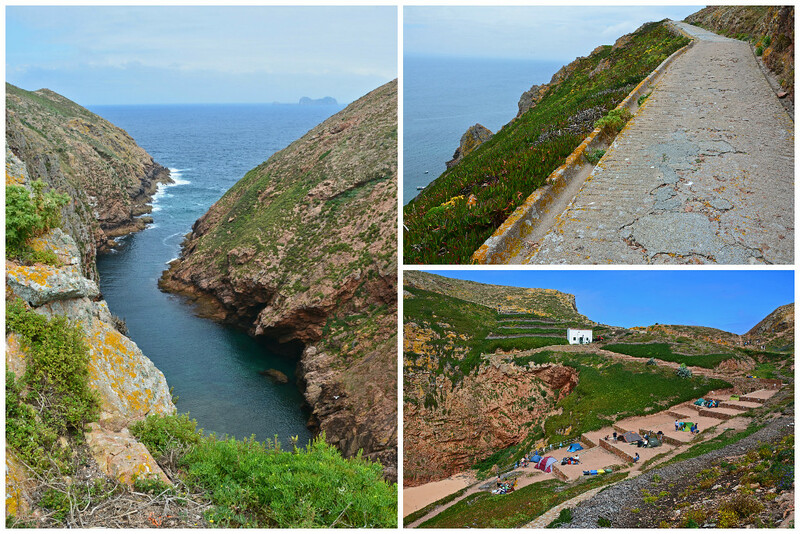 TOUR OPTIONS: Wondering how to get to Berlengas from Lisbon? 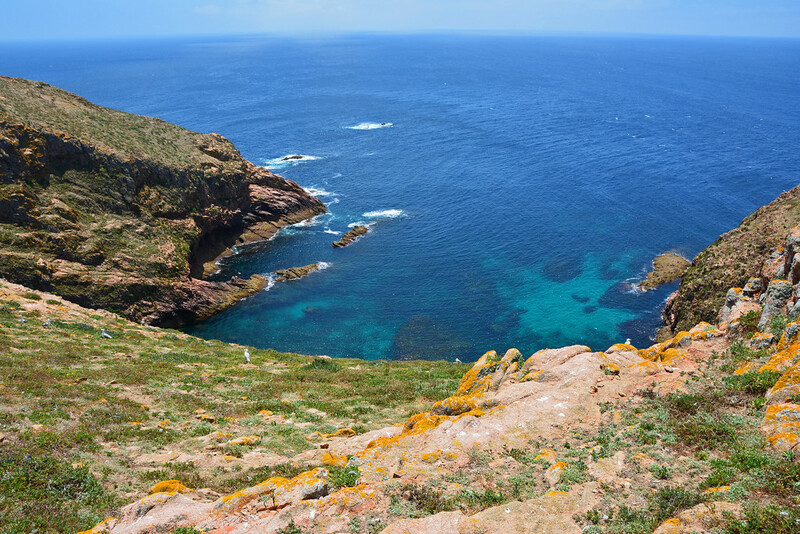 You’ll definitely want to check out this highly-rated guided tour, which includes transportation to and from Lisbon, a boat ride to Berlenga Grande Island, and snorkeling or kayaking around the island! Or have a look at this small group tour option. With the rough seas behind us, we stepped off the boat onto solid ground and were taken aback by the beauty that stood before us. It was like divine intervention, where the clouds parted mere moments after we arrived to the island revealing seagulls soaring over jagged cliffs and natural arches protruding from a vibrant turquoise sea. Following a brief pause to admire the views while ridding ourselves of our rubbery sea legs, we set off to explore the island! 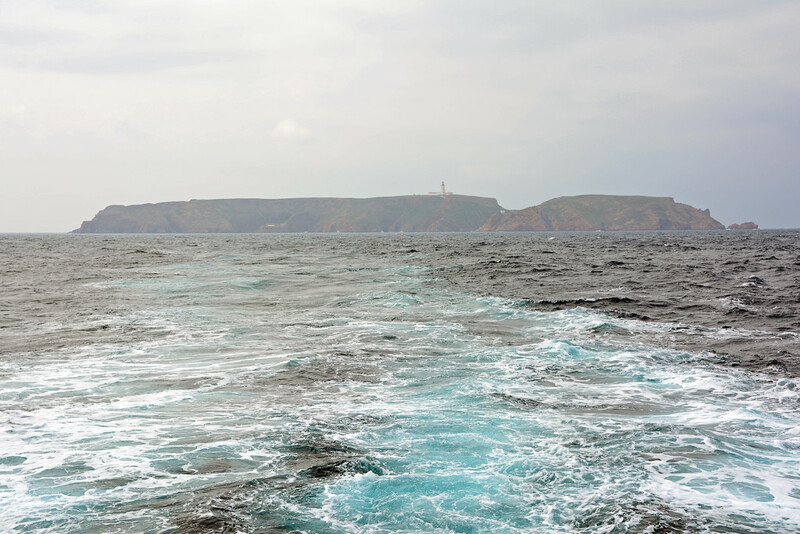 Berlenga Grande is less than a mile long (1500m), only a half mile wide (800m), and has a perimeter of 2.5 miles (4000m). It is close to 300 ft (88m) at its highest point and –100 ft (-30m) at its lowest. Besides a handful of structures, the island is all nature! 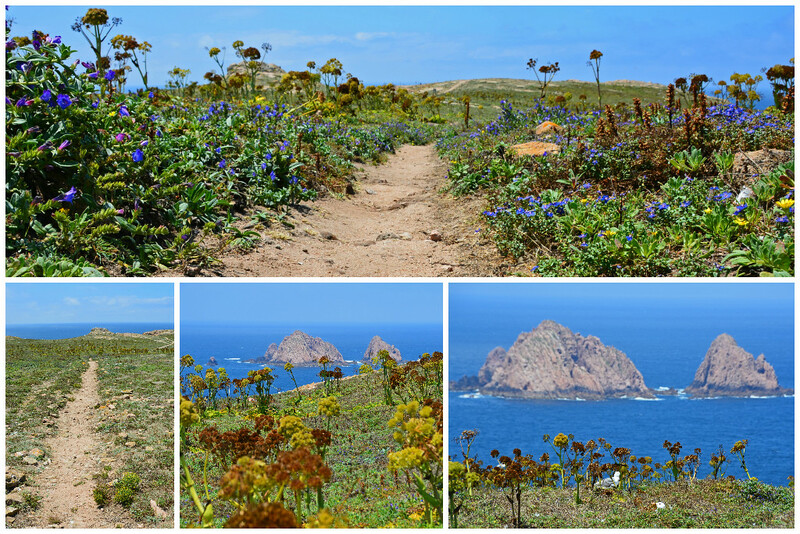 A series of hiking trails take visitors to every corner of the island. Don’t forget your hiking shoes, as only small parts of a few trails are paved. The rest are nothing more than rocky dirt paths through open fields. 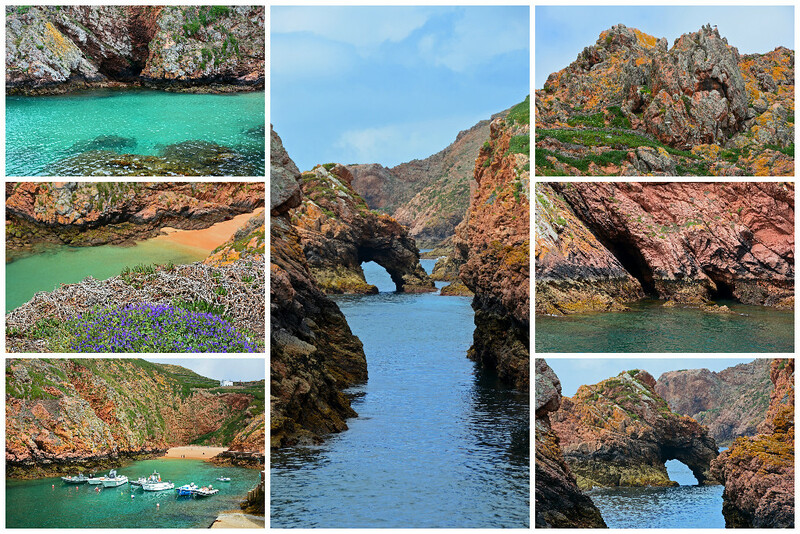 The beauty you will experience on Berlenga is unspoiled and unparalleled! If the sun is out in full force during your visit, the color of the surrounding water will be unlike anything you’ve seen before. Cool blues and unique shades of turquoise swirl around the rocks below as the tide ebbs and flows, pushing water in and out of caves found scattered around the island’s perimeter. 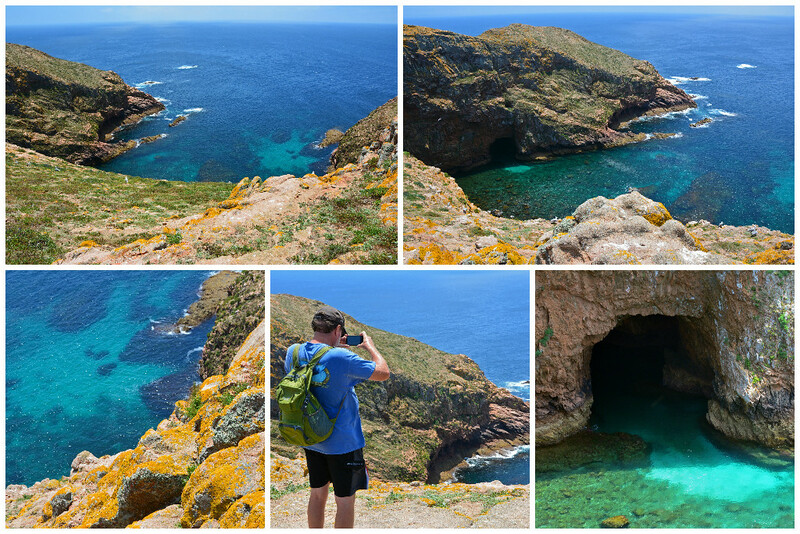 You can access Berlenga’s many caves via a boat tour around the island. We also saw a few people snorkeling and scuba diving just off the coastline. The island serves as a nesting spot for several species of ocean birds and as a simple waypoint for others who may stop by en route during migration. I’m sure at any given time, you will find more seagulls on the island than people. 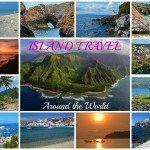 (A maximum of 350 people are allowed on the island at one time.) During our visit, we came upon a few juvenile seagulls of whom the parents were very protective. As such, be mindful of the local and protected flora and fauna, stay on the designated hiking paths, and do not disturb the wildlife. Oh, and the wind blows extra fierce on this secluded bit of land, so hold on to your hat and don’t get too close to the cliff’s edge. 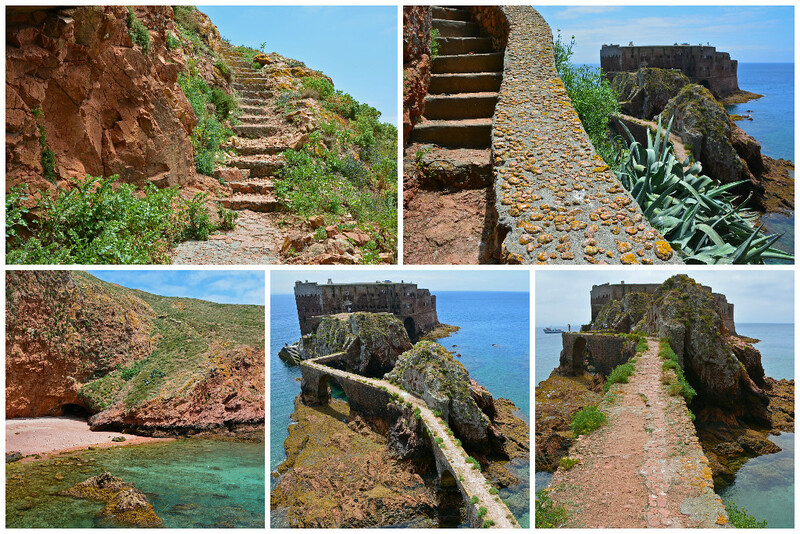 Accommodations are scarce on Berlenga Grande and range from primitive to rustic. You have 3 unique options (plus one bonus option) if you’re interested in spending the night on the island. In the early 1500s a monastery was built on the island to offer assistance to navigation and victims of frequent shipwrecks. It remained on the island until the 16th century when the monks were forced to abandon their service due to disease, lack of communication, and regular assaults. Fast forward to the mid-1600s when it was ordered that the monastery be demolished and its stones used to build a coastal defense, resulting in the fortress that still remains, but is no longer in traditional use. 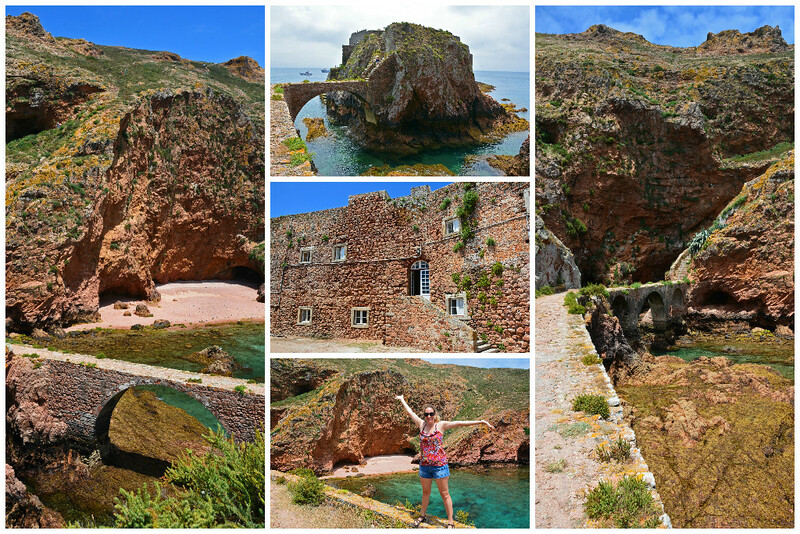 If you’re keen on hostel-style living, you can actually sleep inside the Forte de São João Baptista das Berlengas. 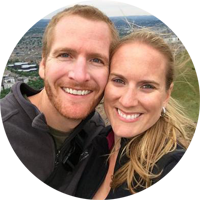 It is quite a hike to get down to the fortress and the climb back up is certainly no joke, but it’s an area of the island that you simply must explore during your visit, regardless of whether or not you’re planning a stay in these bare-bones accommodations. 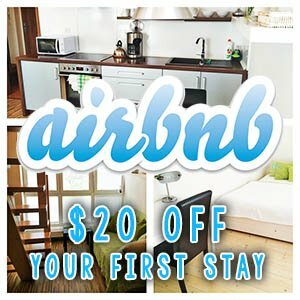 Because accommodations are so limited on the island, you’ll definitely want to book in advance to avoid disappointment. 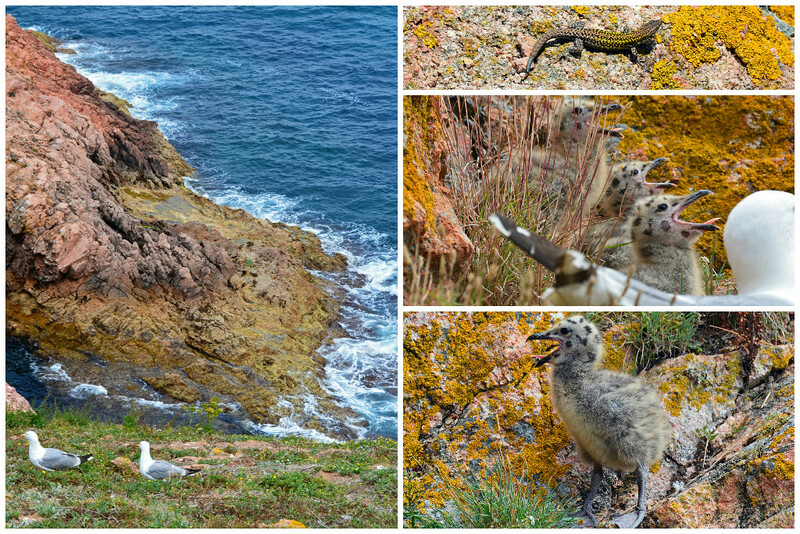 For a truly unique and rustic experience, why not camp on Berlenga Grande? 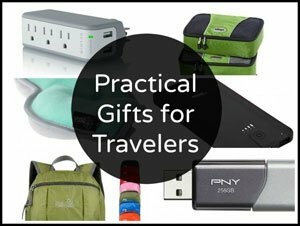 BYOG (Bring Your Own Gear) and pitch a tent under the stars with other adventurous travelers. Just steps from the dock is a tiered section of campsites cut into the hillside. Facilities are primitive and the weather could turn inclement at any moment, but that’s part of the adventure that comes along with camping! Miles away from the mainland, I can only imagine how bright the billions of stars appear on the island on Berlenga. We just might have to go back for another visit to experience this for ourselves! The cost is only 8€/tent and the site can hold six 2-person tents, sixteen 3-person tents, and seventeen 4-person tents. 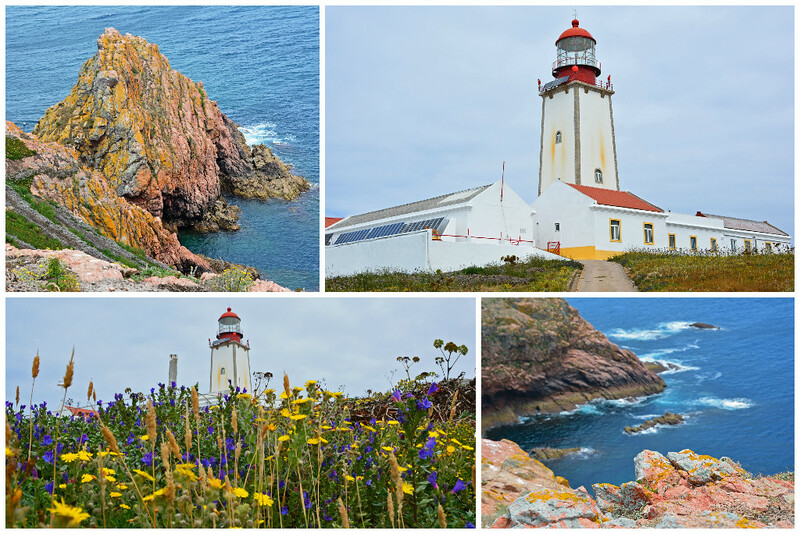 Berlenga Grande’s lighthouse, built in 1841, is now powered by solar energy. A few fortunate individuals just may be able to sleep inside the lighthouse, though it requires a permit from the Ministry of Environment and is only permitted under very special circumstances (i.e. working on a project to help protect the nature preserve). If you’re looking for something with slightly more amenities, just behind the dock is Pavilhão Mar e Sol (Sea Pavilion and Sun), basic half-board lodging with six available double rooms; linens and towels provided. 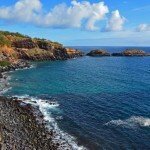 The cost is about 75€/couple and the views of the open sea are unrivaled! The owners of the Sea Pavilion and Sun also run the Sea and Sun Restaurant, one of only two restaurants on the island (the other of which is a basic kitchen within the fort). Meal prices are fairly high at the Sea and Sun Restaurant, but considering everything has to be shipped in from the mainland, the cost is justified. Though the seas were still a little choppy, the ride back to the mainland was much smoother than the ride out. Everyone kept their lunch down and there were smiles all around, as it truly was an amazing day on the island of Berlenga Grande! It’s as if we had discovered a secret; a magical and enchanting place unknown to many. And while we thought about keeping this place all to ourselves, we simply couldn’t resist sharing about this magnificent island chain off Portugal’s central coast. We do hope that you will visit someday and experience the same euphoric feelings we had while standing atop a beautiful natural reserve in the middle of the Atlantic Ocean. Fort of São João Baptista das Berlengas: Contact Association of Friends of Berlengas (Phone: +351 262 750 244). Book a guided tour from Lisbon and let someone else handle all of the details! Bring your sense of adventure… and your camera! 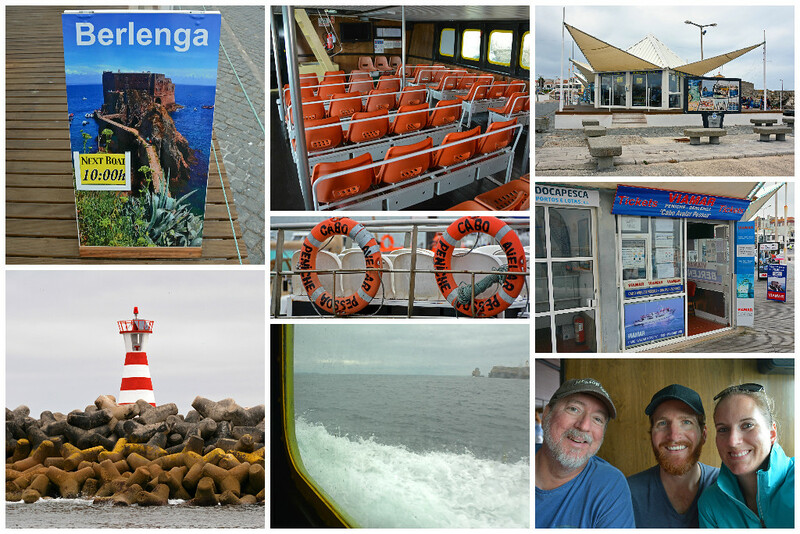 Berlenga is just one of many day trips you can do from Portugal’s capital city. We’ve got other ideas for day trip options from Lisbon for you as well, including Obidos, Cascais, Sintra, and more! We also have booked our 3rd trip to Portugal this October 2018. we have fallen in love with this country. thank you for sharing I enjoyed your page. You’re most welcome! We love Portugal as well and can’t wait to get back for another visit ourselves!